The desert ironwood is a slow growing, shrub-like tree, unremarkable to look at except when it sprouts purple flowers in late springtime, but quite widespread across localized regions of southwest Arizona where it inhabits gravelly washes and low elevation hillsides. The tree is important to the local ecosystem because it benefits many other species of flora and fauna so was chosen to be featured in the 129,000 acre Ironwood Forest National Monument, northwest of Tucson. The scenery and general vegetation are very similar to the nearby Sonoran Desert National Monument - both contain isolated mountains separated by wide, empty basins filled with saguaro and many other species of cacti. Additional points of interest in the ironwood forest include a working copper mine, many ancient petroglyphs and several ghost towns. Although established back in June 2000, there are still few signposts or visible indications of the location of the new monument, which is administered by the BLM rather than the NPS, extends from the Sawtooth Mountains south of Casa Grande across the Silver Bell, Waterman and Roskruge Mountains, and is bordered by the wide Avra and Santa Cruz Valleys on the east and the even more extensive plains of the Tohono O'Odham Indian Reservation to the west. 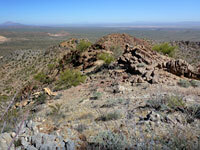 The southeastern tip is just a few miles from the edge of the Tucson Mountain section of Saguaro National Park. Apart from large spoilheaps, tailings ponds and other debris around the silver mine, all the region is quite unspoilt. Several rather obscure unpaved roads enter parts of the ironwood forest area but there is only one paved route, Avra Valley Road, starting from exit 242 of I-10 at Rillito. It passes through 10 miles of farmland with scattered settlements then crosses into the monument, where the land begins to rise and saguaro appear, and quite soon enters the private land around the silver mine. The only way to continue is to follow a good gravel track (Silver Bell Road) that branches off to the left and winds through the western foothills of the Silver Bell Mountains, turning north then east, eventually back towards the interstate at Marana, while an alternative route (Sasco Road) heads northeast over more hilly land to I-10 exit 225, passing the 'ghost town' of Sasco, where a smelting plant to process ore from the Silver Bell mines operated between 1907 and 1919. Sasco Road crosses the Santa Cruz River and is often impassable when water is present, so the Silver Bell Road is preferred for non 4WD vehicles. Further south, the dead straight Manville Road crosses the Avra Valley and becomes a dirt track just before the monument boundary, which is marked by an unlocked gate and a sign for the Agua Blanca Ranch. The track leads through flat, bushy land then climbs into the remote Roskruge Mountains. 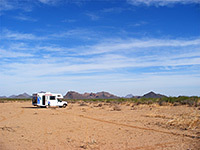 Camping is allowed free anywhere in the monument, and as the Manville Road entrance is only 10 miles from Saguaro National Park, which has no campsites, this makes a good place for overnight stops for people visiting the park. Just after the gate is a large open area suitable for parking or pitching a tent. The best way to see more of the scenery of the Ironwood Forest National Monument is to hike up into the mountains, and perhaps the most interesting area is around the silver mine. Near the start of the Silver Bell Road is the remains of the village of Silver Bell - various long abandoned, ruined wooden houses now overgrown by bushes and cacti. 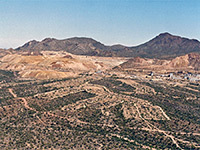 Just south of here is the edge of the Waterman Mountains, and climbing a few hundred feet is enough to afford great views over the mine complex, the rugged peaks to the north and the vast empty desert of the Tohono O'Odham reservation to the west. 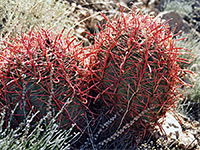 Many different types of cacti grow on the slopes, mostly species of opuntia, ferocactus and echinocereus, including the rare echinocactus horizonthalonius var nicholii (Nichol's Turk's head or eagle-claw cactus), and in spring the hillsides are filled with blooms of many different colors. The nearest towns with hotels close to Ironwood Forest National Monument are Casa Grande, Marana and Tucson. A comprehensive guide to the natural history of the Ironwood Forest area is available from the Arizona-Sonora Desert Museum.